An excellent article Paul! Funnily enough at our recent Conversations meeting at the seniors organisation U3A, here in Port Sorell, Tasmania, we were discussing the Koch Brothers and the damage to democracy and the environment that they have been inflicting for some 40 years. (and others like them, like former Australian Rupert Murdoch). So at least it’s good to know that their infamy is spreading worldwide. Now if only people, politicians and institutions would stop taking their money! I have this one hope, Margaret, that the spread of the Internet will in time make it impossible for the Koch brothers and their ilk to carry on. Because there will be millions of everyday people who will spread the word and say ‘No’. Shame because that is what we expect our Governments to do! Yes, reluctantly I have to agree with you, Bela! But it’s not just the USA. It’s everywhere! Where are those grassroots? Where are the political movements? The veil has been pulled aside. Unfortunately we suffer as their deeds and those of others … including the greedy who take their money …. still continue. I agree — we need to root out the money and ensure that Congress is not on the take and that ALL politicians are completely transparent. Dear Stacey, I totally agree! The only thing that can be said is that it isn’t going to go much longer. Planet Earth will have its say and it will not be pretty! The Koch Brothers have a lot of fingers in a lot of pies, contaminating everything they touch. I am saddened by having to agree with you, Colette. It’s a very uneven world! The Elite are the elite at their game plays.. I don’t know what to say, Sue. But to thank you for your reply. Sadly, greed rules … and as long as that is true, then money will talk. I do not believe that “everybody has their price”. I do believe that integrity in its broadest sense does still exist in our society, but we are on the proverbial ‘slippery slope’ unless something changes. I think of myself as a pretty positive person, but the reality of our world from my perspective is not good. Will some idiot flaunt an over-inflated ego and trigger a nuclear holocaust? Will continual experimentation with the food chain eventually kill us? What will happen when the millions of tons of nuclear waste dumped (since the 1940s) in the Atlantic in steel drums, escapes as the drums corrode? Ever wondered why far more money seems to be put into researching cancer treatment, than is put into research into the cause? Is it really negative to conclude that cancer treatment is a huge business, so why risk eliminating the cause? It always comes back to money, and the resulting power. Trump is so proud of his tax dodges, but his supporters don’t seem to grasp the concept that government services being provided are directly related to taxes received. I am sounding like my late grandmother (who lived through two world wars), and my late father but then… we haven’t made much (if any) progress in past 100 years in the humane aspects of our society have we? Thank you, Colin, for your lengthy reply. All of it so true, I’m bound to say. I, too, believe in the power of integrity. 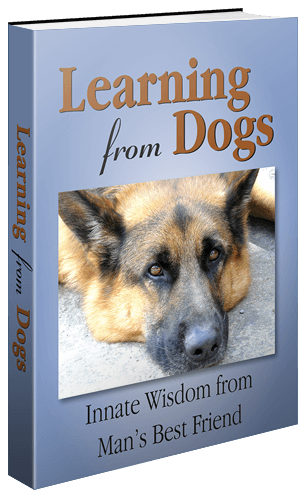 After all this blog is fundamentally all about that: https://learningfromdogs.com/lfd-vision/ . We seem to be going through a sad period just now. When there is so much to do. The Koch Brothers, The Rockafellas and other Billionaires control much of what happens on the planet, especially behind closed doors. They answer to no one, not even governments. We will never know the true extent of their manipulation of world events but it is never for the benevolence of people as a whole. They are always willing to toss out cookies or bombs to manipulate people to their own ends. This is the problem with our civilisation and has been the downfall of prior civilisations. We are facing collapse for a lot of reasons, and it is my feeling that it has to be… We have just gone too far into the Abyss to stop ourselves from falling. It is a dismal picture but I fear an accurate one. I was born in London just six months before the end of WWII. I wonder if I will die in the early days of WWIII, or its equivalent? There is so much to concentrate that is bad and it will do us no good to worry so much when we can do so little to stop it. Historically speaking the lack of love in the world is our biggest threat. You and Jean should just focus on loving each other and your family… And your anipals. There is wisdom in not feeding into the fear, especially as we have more than enough of it. Those that do bad, will continue regardless. All we can do is to try to stay ahead of it and love as much as we can. Not sure that I agree with “Those that do bad, will continue regardless.” I find that a rather “head in sand” approach. It takes two to tango, and so anybody with money to influence others, must have others who need the money otherwise nothing happens. Either party can change. A financial collapse? A political change? Anarchy? Pressure from the populace (it will be interesting to see how France resolves its current problems). A geographical catastrophe? I think we should acknowledge the reality that two or more egomaniacs can start a war, but also believe that, like many movies, good will win over bad in the end. Perhaps Faith still has a place in our species? With the apparent splintering of our society, aggravated by nationalistic and self serving political rhetoric, I would suggest that unrest within the general public is going to grow, with a corresponding increase in racial, cultural, sexist and other stereotyping ultimately resulting in violence. Apparently one guaranteed way to bring any group of people together, is to threaten them as a group. Suddenly all differences are forgotten and a concerted survival strategy is developed. Perhaps the current unrest in France will spread and force governments to act? Perhaps a war is inevitable, which will draw people together again? To be totally honest, I am rather embarrassed to acknowledge that I am of the same species as the some political figures today. Me too… I don’t stick my head in the sand, Colin. I am fully aware of what is going on and I actually approve of ordinary people standing up together to demonstrate against the cruelties of life on all fronts. But we mustn’t make ourselves sick over it. We need to be loving and compassionate beings or we will be as bad as the forces that continue to trample over people. Unfortunately I see lots of polarisation and that inevitably leads to conflict which destroys us all. Totally agree. If we give in to the hypocrisy, immoral, unethical, self-serving (etc.) behavior of leaders,then we are in trouble. In our own individual ways, we must set examples of a compassionate society. To do nothing is tantamount to endorsing the status quo. Colette and Colin, all I will add is that these are very uncertain times and trying to predict the future is incredibly difficult. Apart from climate change and that is incredibly urgent. I do like: “Historically speaking the lack of love in the world is our greatest threat.” Not sure what else to say! That pretty much says it all Paul. Those of us who believe in prayer ….should pray. Those who don’t … should appeal to whatever/whoever they believe in. All of us should lead by example. Glenda, I make no apologies for republishing this essay by George Monbiot. This is a blog about integrity, in the main, and both George, and Tom Engelhardt, have given me blanket permission to republish their material. The fact that there have been so many comments seems to me to endorse that decision to republish the essay. But it is a fact that the smallest percentage of that seven billion control the majority of the wealth. It is neither a right or a left in politics but a fact. However, you voice very real concerns about population growth and climate change and all the stresses and strains that this places upon the only place we can call home. I hope very much to keep you as a subscriber to Learning from Dogs. I am sorry that I upset you. Oh, Glenda! Your statement saying “and not have to listen to or read… Yet again… the same tired clichés about how the world is falling apart, the Koch Brothers, yadda, yadda…” is so telling. That we even think of the problems facing humanity as ‘clichés’ is alarming to me. Yes, I do like the good stuff too, but that doesn’t entirely negate the bad stuff out in the world. I don’t believe that one political position (left or right) is responsible for the mess we are in globally. But we cannot demean anyone who brings it out to show us what we (each and every one of us) has done to our living planet with our misguided attempts at providing ourselves with a good life at the expense of others. I encourage you to look at this Youtube talk from Bioneers (and no, it will not depress you, but it may motivate you to think slightly differently). Well presented Collette. Based on my understanding of what a “cliche” is, I would suggest that it is a matter of perspective. I don’t believe that writings about our worldly problems are “cliches” at all, but rather re-affirmations that they do exist. Sadly, constant re-affirmations are necessary. Never think that you should apologise for a post Paul. Your compassion and conciousness for an equitable world for humans and animals alike, leads you to the stories that you share here. It is out of a sense of wanting to warn others of the dangers out there, that you do so. There will always be people who do not want to hear the message. And we can only hope that one day, they may see that differently and change their mind. The stories change, and we need the story tellers, otherwise we learn nothing. Thank you, Glenda, I for one find that a very magnanimous contribution. These are such uncertain times. But thanks to a video that I watched a little earlier, the one that Colette introduced, this one https://youtu.be/vzmjF1jE2K0 , it all makes sense. If you can do watch that video.